Problems with Hardware components need serious handling because it is difficult to be localized and removed without the right tools, expertise and supportive experience. Explanations will revolve around problems that often occur along with how to overcome them. After turning on the PC does not react anything, there is no display on the monitor, there is no indicator light (led) that lights up, the power supply fan does not rotate, the indicator light on the monitor does not turn on. After turning on the PC does not react anything, there is no display on the monitor, there is no indicator light (led) that lights up, the power supply fan does not rotate, the indicator light on the monitor lights up. Check whether the cable is connected properly and the plug is properly installed in the socket, also check that there is an on / off button behind the Power Supply already in the On position, if you are sure it is installed correctly but still there is no response to convince you please replace the power cable. Problems occur due to the absence of incoming electrical voltage, damage to the power cable. but if there is still no response means the problem is with the Power Supply, please replace the PS, I recommend that you replace the damaged Power Supply with a new one, and be careful when installing it. Note: If the damage is only on the Power Supply after you replace it, the computer will return to normal work. 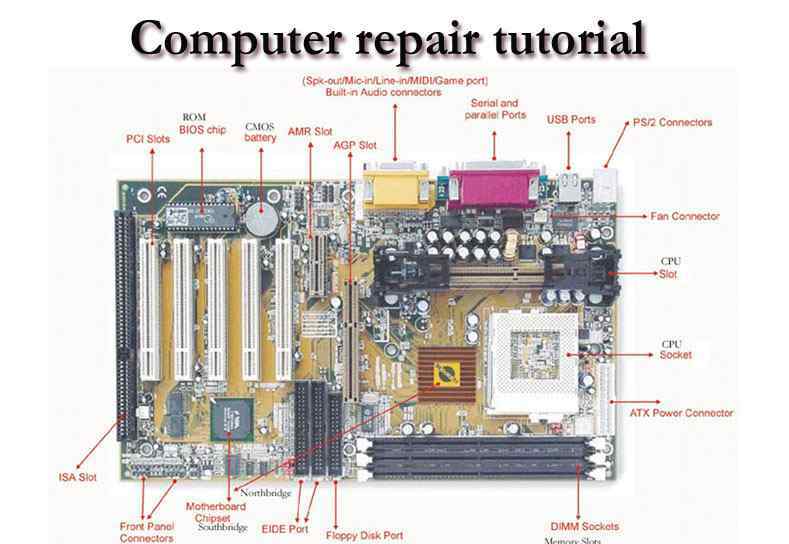 Unless there are problems with other components such as Mother Board, VGA Card, and Memory. After turning it on, there is no display on the monitor, the indicator light (LED) on the front panel lights up, the LED indicator light flashes, the power supply fan and processor fan rotate, there is no beep sound on the speaker. The first step is to remove all power cables connected to the electricity, data cables to the monitor, cable keyboard/mouse, and all cables connected to the CPU, then remove all cashing screws. In the case of an open casing, please remove the other components, namely the voltage cable from the power supply that is connected to the motherboard, hard drive, floppy, be careful in the process, do not rush. Likewise with the Card attached to the Mboard (VGA, Sound or other Card). Now the only one attached to cashing is MotherBoard. Please check the Motherboard carefully, see Chip (IC), Elko, Transistor and the other whether there is a fire. If there are no signs of a burning component, the motherboard is probably still good, but sometimes the Motherboard doesn't work because of damage to the program in the BIOS. When the CPU is turned on and then does the Post process after that the process does not continue and is silent for a while does not directly enter the operating system, and then on the monitor screen there is a message "hard disk error, hard disk Failure, after that the message" press F1 to continue "appears after us pressing the F1 button does not enter the Operating system and the message "Operating system not found" appears. Check the voltage and data cable that goes into the hard drive is loose, you should tighten it, then turn it on and try to hear whether the sound coming out of the hard drive is normal, if it's not normal means the hard drive is damaged in the controller. When the CPU is turned on then the Post process appears after the message "Operating system not found". There is a possibility the operating system is damaged, can be overcome by reinstalling or if your OS uses Windows 2000 / XP, Vista, 7,8,10 there is a repair facility. or there is a possibility that your hard drive is not detected and do the steps above. D. Hard sector hard drive. There are several factors that cause bad sectors such as unstable electricity voltage, frequent power outages after use is not shut down, usage is too long, there are 2 types of bad sectors namely physical and software. To overcome this there are several ways, including using software to eliminate the bad sector. 1. Check the data cable and the voltage cable that goes to the CD-floppy, the BIOS setup is detected? should be set to auto. Check if the LED is on if it doesn't damage the Controller. 2. Damage is to the mechanical motor or rubber motor. 3. Damage Usually on optics, but there is a possibility that it can still be fixed by setting the optical network. 4. Dirty Head, can be cleaned using Cutenbud (the steps above can be found in the complete e-book "Quick and accurate computer repair method". Be careful in Bios Update, when you update you mistakenly choose the Bios version, the PC doesn't work even you can't enter the BIOS. The CPU issues the Beep sound several times on the speaker and there is no display to the monitor screen, even though the monitor is not a problem. Usually, the update cannot be canceled, only certain types of motherboards have backup BIOS on the chip, there is the original BIOS type that cannot be deleted, to be able to restore it you just move the special jumper position which usually has instructions in the manual. Then turn on the PC and wait 10 seconds, the original BIOS has been Restore, return the Jumper Position to its original position, and the PC is ready to run again. If the motherboard does not have these facilities, the BIOS chip must be sent to the manufacturer, you can see the BIOS type in the manual. Be careful when installing it, don't let the IC BIOS foot break or reverse its position. The Beep sound indicates a certain error message from the BIOS, the sound shows what type of error occurred on the PC, usually, errors in undetectable memory, VGA cards, which are not installed properly, the processor and even the data cable monitor can be the cause. Please check the problem. 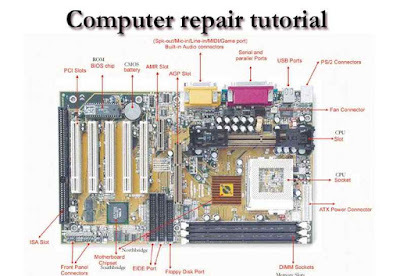 BIOS errors usually do not all motherboards indicate the same error depending on the type of BIOS. Beep 1x: RAM / Memory is not installed properly or damaged, Beep 6x: Gate A20 error - Shows the damaged keyboard or IC Gate A20 itself, Beep 8x: Graphic Card / VGA Card is not installed properly or damaged, Beep 11x: Checksum Error, check Batre Bios, and replace it with a new one. Beep 1x Length: RAM / Memory is not installed properly or damaged, Beep 1x Long 2x Short: Damage to the Graphic Card (VGA), Check can also Installation in the slot is not right (less enter), Beep 1x Length 3x Short: Keyboard is broken or not installed. Beep Uninterrupted/continuous sound: RAM or Graphic Card is not detected. Symptoms: CMOS Checksum Failure / Battery Low message appears, due to the abnormality that supply CMOS / BIOS IC is not normal because the battery is weak, so the BIOS settings return to the default factory defaults, and the hardware configuration must be reset. Solution: There are several factors occurring hangs including (There is BadSector on the Harddisk, There is a Virus, There are problems in Hardware such as Dirty / Damaged Memory, Dirty MBoard / Broken, Cooling Fan rotation of the fan is weak, Power Supply is unstable. You should not force it to be used because it will have more fatal consequences. J. Computers often display blue screen what is the cause? Solution: Blue Screen message can be caused by a corrupted Windows system, Can be from Memory, Can be from a hard drive, can be from other components, depending on the blue screen message displayed. Solution: The cause of your computer is slow processing there are several factors, namely: The hard drive space is too full, too many programs/software that takes up hard disk space and memory, there is a virus, a bad sector hard drive. If the operating system is damaged (corrupted) which does not have another operating system to boot, we can repair the installation (Repair Installation) that works as the initial setting. Then make sure the key has a valid operating system key (SN). The entire process will take approximately 1/2 to 1 hour, depending on computer specifications. If asked for an administrator password, you should choose the second repair option, not the first. - Insert the operating system CD and boot from the CD. - When the second repair option R = Repair appears, press the R button. This will start repair. - Press the F8 key to approve the next process "I Agree at the Licensing Agreement"
- Press the R button when the directory where your operating system is installed. Usually, C: WINDOWS Next, check the C: drive and start copying the files. And automatically restart if needed. - Then asked to enter the key, enter a valid operating system key (key). - Normally you want to remain in the same Domain or Workgroup name. - Then the computer will restart. - Then we will have the same screen as the system activates when the installation is normal. - Register if you want it (usually not needed). - When the R = Repair option first appears, press the R button. - Move to the CD Drive drive. - If the operating system is installed elsewhere, change it according to location. Damaged or Missing (Missing or Corrupt), If you get an error related to damaged or lost the hal.dll file, there is a possibility that the BOOT.INI file has a misconfigured configuration (misconfigured). Insert the operating system CD and boot from the CD. Press the number according to the location of the Windows installation that you want to repair accordingly. "Windows could not start because the following files are missing or corrupt. WINDOWSSYSTEM32CONFIGSYSTEM or INDOWSSYSTEM32CONFIGSOFTWARE"
- When the osi R = Repair first appears, press the R key. Press the number according to the location of the Windows installation that you want to repair accordingly. - Enter the administrator password if required. - Press the number according to the Windows installation location that you want to repair accordingly. - Enter the following command, where X: is the drive address of your CD ROM (Adjust!). Physically damage to the computer can be detected and repaired by checking and finding problems by checking each device in sequence according to its working system. a. Check the main power supply cable connection and DC voltage cable. b. Check the keyboard cable connector. c. Check monitor cable connections and monitor power cables. e. Check the power cable connection and data drive cable. - This diagnosis includes system configuration, system configuration changes, and disk format. If during the checking of each of the above stages there is damage then first repair the damage by replacing it with the good one. How to choose the right auxiliary equipment in repairing a PC is: select and use a measuring device in accordance with its function, for example, to measure voltage using a voltmeter, to measure resistance using ohmmeters, and the like. Select equipment that matches the object, for example, to remove the flower bolt using a flower screwdriver that fits the size, and the like. By using a voltage check voltmeter + 5V, + 3.3V, + 12V, -12V, -5V in the I / O slot if there is no possible voltage the damage is on the power supply or connector / soldiran / path on the motherboard and by using the logic probe or CRO check signal CLK, OSC, PCLK, RESET DRV, CH RDY I / O, CH I / O CHK, ALE, MEMR, MEMW, IOR, IOW, AEN in I / O slot. See checks 2 and 3 for answer A number 2, then check 4. If the power switch is turned on, the fan will rotate, the voltage on the P8 and P9 sockets when measured using a voltmeter is as in Table 8. Especially for the power good signal when measured with a voltmeter it will voltage + 5V a moment later it drops to close to 0V when the power switch is turned on . If the power switch is turned on or the power cable is plugged in, then the fan is silent, all voltages in the socket when measured using the voltmeter will be zero, except on pin 9 is + 5V as a voltage source in the standby position. If pin 14 is connected momentarily to pin 9 using a cable, the fan will rotate, the voltage on each socket pin 20 when measured using a voltmeter is as in Table 9. Especially for signal power good when measured with a voltmeter it will voltage + 5V for a moment then drop becomes close to 0V when the power is turned on. In repairing PC things that need to be done are: make improvements in accordance with the recommended safety procedures, use the appropriate equipment and measuring instruments, record hardware specifications, observe the symptoms of the damage, diagnose the damage in accordance with the symptoms, arrange and take steps corrective steps, replacing damaged components in accordance with the specifications, recording the replaced components and reporting the results of repairs. • Check the cleanliness in the CPU case. Clean dust and other dirt with brushes and vacuum cleaners, if necessary prepare electrical contact cleaner to clean the motherboard. • Check the temperature conditions of each component such as Power Supply (make sure the fan rotates normally), VGA Card and Processor Heatsink. • Ensure that various components (such as RAM, VGA Card, IDE / SATA connectors, Power Supply connectors, etc.) are installed correctly, to make sure they can be pulled out and re-installed. • If you have just installed a new hardware component (for example a VGA Card), just unplug it first and try running the computer just the BlueScreen cause from the computer. • Clean the hard drive from antivirus, malware & spyware by running a virus scanner program, for example, Norman Anti Malware. • Uninstall the driver that has the problem, how to enter the Computer Management window, click Device Manager and look for components that have the exclamation mark, or component drivers that have just been installed or updated. • If you need to uninstall the antivirus program first, if the condition of the computer is normal it can be installed again and make sure the database engine is always up to date. • We can also use the "System Restore" utility to restore computer settings to the previous condition. How to click Start, All Programs, Accessories, System Tools, System Restore. The condition of a bad hard drive can also cause BlueScreen, therefore check the condition of the hard drive by running the CHKDSK command. Also, run the Hard Disk Defragmentation program to ensure the hard drive works optimally. Check the Memory / RAM condition, make sure it is installed correctly, and run the program to check the Memory condition for example "Windows Memory Diagnostic".